We pride ourselves on helping people resolve their differences. Our goal is to assist couples in settling their disagreements and helping them reach closure. Through divorce mediation, we act as neutrals to serve all parties in legal disputes. We work as a team and we also mediate conflicts that have not reached the litigation stage such as property divisions, custody matters, separations and estate issues. We pride ourselves on helping people resolve their differences. Our goal is to bring people to the table to successfully settle their disagreements and reach closure. Wee can assist clients in this process in a non-adversarial manner. Often, mediation is an expeditious way of handling the dissolution of marriage in which both parties leave the situation in a satisfied manner. Since successful divorce mediation has the potential to save both parties thousands in legal fees and also has the ability to prevent the relationship between spouses from deteriorating any further than it may already have, serving as a mediator is a gratifying experience for our firm. Preserving these familial relationships becomes even more important when children are involved since parents who litigate usually find it difficult, if not impossible, to communicate after the litigation. with this simple and educational comparison tool. Our team is able to engage in “reality testing” to enhance the divorce mediation process. In essence this allows both parties to get an idea of what may happen if the case is decided by a judge or jury, thus giving you a better idea of whether a mediated resolution is worth considering. Why is Mediation Typically More Effective? 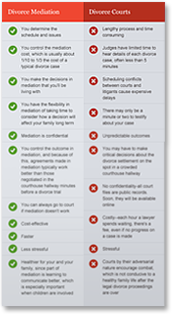 Why is Mediation More Cost-Effective? Is There a Role for My Attorney? Do Mediators Receive a Percentage of the Settlement?